Introductory information on the I-SPY 2 TRIAL. 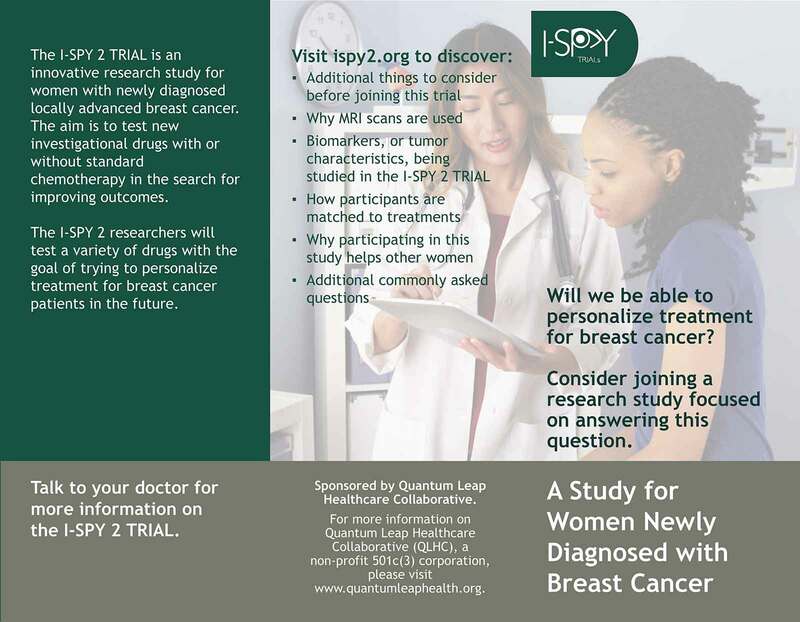 The I-SPY 2 TRIAL is an innovative research study for women with newly diagnosed locally advanced breast cancer. The aim is to test new investigational drugs with or without standard chemotherapy in the search for improving outcomes. The I-SPY 2 researchers will test a variety of drugs with the goal of trying to personalize treatment for breast cancer patients in the future. The I-SPY 2 TRIAL = Investigation of Serial studies to Predict Your Therapeutic Response with Imaging And moLecular analysis 2. The goal of I-SPY 2 is to help us learn if adding investigational drugs with standard chemotherapy will improve the treatment of breast cancer. Having chemotherapy prior to surgery, or neoadjuvant chemotherapy, allows you and the researchers to see how your tumor responds to treatment. In I-SPY 2, you will be assigned treatment with or without investigational drugs based on your tumor characteristics. The structure of this trial allows us to learn more quickly which investigational drugs will be most beneficial for women with your particular tumor biology. You will be closely monitored to see how your tumors respond to your treatment. MRIs, core biopsies, and blood draws will also help identify tumor characteristics that will help researchers learn how individual tumors respond to new drugs. Download the I-SPY 2 TRIAL Patient Brochure.